Fluorescent minerals are certain minerals that when exposed to ultraviolet radiation (light) they emit visible light. Another way to describe this process of fluorescence is when invisible short wavelength radiation is absorbed by a material and then is converted and re-emitted as a longer wavelength. This longer wavelength is the visible light that we are able to see. Visible light is also called "white light". The wavelengths that we are able to see range from 400 nanometers (nm) to 700 nanometers (nm). 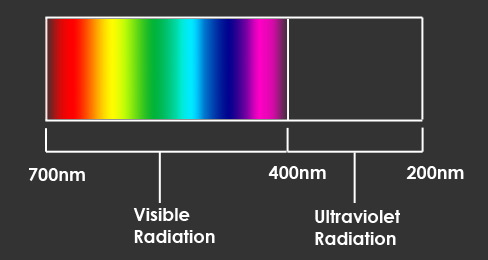 The invisible wavelengths of ultraviolet light range from 200nm to 400nm. Most fluorescent minerals require an activator that initiates fluorescence. The activator is a type of impurity of the mineral. One of the most common activators is manganese. Activators are responsible for the types of fluorescence. A mineral may fluoresce different colors or brightnesses when exposed to different activators. Depending on your mineral it will react differently to ultraviolet light. Some may produce bright and vibrant colors while others are barely visible. Specimens will also react differently depending on the type of UV lamp that you use to illuminate your subject. The three main types of UV lamps are long wave, medium wave and short wave. As their names suggest they emit different wave lengths of the UV spectrum. The minerals which I have used here are calcite, willemite, and fluorite. Each specimen varies from pattern, mineral concentration, and luminance. I have illuminated these minerals with a short wave lamp, which best brings out their vibrant colors. Some of these samples like the willemite and calcite crystal exhibit phosphorescence. Phosphorescence is when a mineral continues to emit light even though the source of excitation has disappeared. The black mineral that is apparent in the first three images is a mineral called franklinite. Franklinite is a zinc iron ore. Franklinite was named after Franklin, New Jersey, the town where it was discovered. Franklinite does not fluoresce, but is often found with calcite and willemite. The willemite and calcite specimens were hand picked by me from a quarry at the Sterling Hill Mine in Ogdensburg, New Jersey. The Sterling Hill Mine is a former zinc mine that now currently operates as a museum and quarry for fluorescent minerals. The majority of this specimen is calcite. Under white light you can locate this mineral by its milky white appearance. When calcite fluoresces it emits a red/orange color. In other cases calcite has a darker more reddish color, like in the first image at the top of the page. The few green areas in the middle of the image are small traces of willemite. This is probably from willemite powder that filled in cracks. This image was taken at a 1:2 magnification. The mineral demonstrated in these images is willemite. Under white light willemite can be identified by its tan color. When illuminated by UV light willemite emits a vibrant green color. This image was taken at a 1:1.5 magnification. This specimen contains both willemite and calcite. Under white light the top section is calcite and the lower section is willemite. In the UV illuminated image the orange mineral is calcite and the green mineral is willemite. The two black areas are two franklinite crystals. This image was taken at a 1:2 magnification. This specimen contains fluorite crystals. These fluorite crystals can be hard to see in the specimen while under white light, but they become very obvious when fluorescing. The fluorite can be seen fluorescing in the second image as a blue ring of crystals. This image was taken at a 1:4 magnification. This specimen is a calcite crystal. This sample is not a perfect type of optical calcite quality. The crystal cleavage of this calcite is a rhombohedron. Other than the orange fluorescence of the calcite towards the top of the page this calcite has a blue fluorescence. This crystal also shows some green fluorescence from an undetermined source. This calcite crystal has a long phosphorescence of about 2.5 seconds. This image was taken at a 1:4 magnification. I decided to present these fluorescent minerals as two images side by side because it seems you can get a greater appreciation for the fluorescent phenomena if you compare it under natural light. In order to do this I created one lighting setup that could act as lighting for both images. For the white light setup I used two incandescent lamps. The lamps were situated on each side of the specimen. A problem that became apparent was that the crystals were reflecting my light sources and creating hot spots. I easily overcame this by diffusing the light. This came in the form of two plastic cups over the two lamps. The lamps with the diffusers were approximately three to four inches away from the specimens. I also placed a piece of black velvet under the minerals for a background. For the UV lighting I taped the shortwave UV lamp to a small riser jack. This enabled me to easily take the lamp out of the scene for the natural light photograph. It also let me raise or lower the UV light source to adjust for each subject. 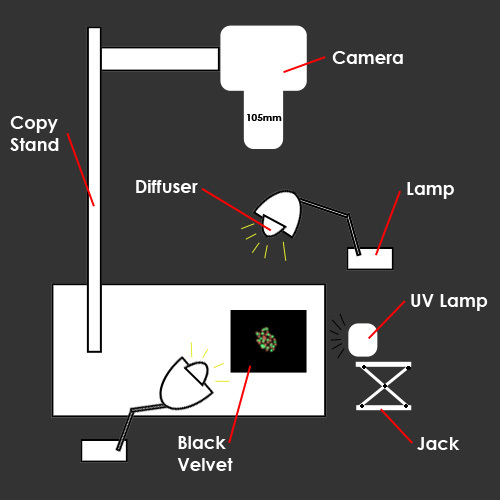 The shape of the lamp was a bit awkward, so angling the UV lamp to be held by the jack was a big help. The reason I decided to shoot closer macro images of some of the specimens was because my UV light source was not very big. On larger subjects the lamp could not cover the entire area required. Shortwave lamps are fairly expensive. This particular lamp contained a 4W tube. These types of lamps are commonly called "black lights". I suggest that when using this type of lamp you use caution. Wearing UV protected sunglasses can be a wise safety precaution because prolonged exposure can be dangerous to your eyes. The photographic equipment I used was a Canon Digital Rebel, 105mm Sigma lens, 1 gig compact flash card, and copy stand. The copy stand was a very useful piece of equipment during this shoot. It enabled me to keep the camera still, while also being level in relation to the subject. Along with the Canon Rebel, I used a remote to trigger the exposure. The remote cut down on vibrations from me physically touching the camera to take a picture. The fluorescent minerals created some problems while trying to photograph them. The fluorescent emission was generally very weak. To achieve a reasonable exposure I raised my ISO to 1600 and my average shutter speed was 15 seconds. Although this enabled me to get closer to the exposure I wanted, the ISO of 1600 gave me noisy images. I had expected to get a lot more noise in my images and was pleased that I had gotten better results than I had anticipated. Some of the specimens had different photographic requirements for capturing them. The calcite required twice the exposure time than the bright green willemite. The more challenging specimens were those that contained both calcite and willemite. For these specimens I had to take two separate exposures for each mineral so that I didn't loose detail. The Audubon Society Field Guide to North American Rocks and Minerals. Chesterman, Charles W. Knopf: New York; Random: Toronto, 1978. Basic Photographic Materials and Process. 2nd ed. Stroebel, Leslie , John Compton, Ira Current, Richard Zakia. Boston, MA: Focal Press - Butterworth - Heinemann, 2000. Treasures from the Earth: The World of Rocks and Minerals. Shaub, Benjamin M. New York: Crown, 1975. Biomedical Photographic Communications (BPC) program at the Rochester Institute of Technology (RIT). Article hosted on Micscape Magazine (Microscopy-UK).